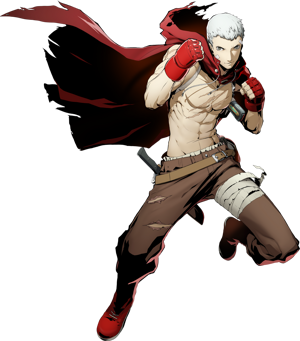 Difference between revisions of "Akihiko Sanada"
My muscles roar as they break the limits! Our fists shall collide! And there's the gong! Taking action in Persona 3, he was a member of the Specialized Extracurricular Execution Squad (SEES). In his pursuit of inexhaustible power, he now travels the world in training to better himself. His Persona is Caesar. In exchange for his short reach, he's an explosively strong infighter. Cyclone Uppercut (サイクロンレベル) forces opponents upwards, with a strong, top-class follow-up to be proud of!